Following instructions from House Speaker Joe Straus, Texas lawmakers plan to study the benefits of accepting high-level nuclear waste from around the country, a controversial proposition. But even if Texas seeks a waste facility, huge hurdles would stand in its way. Could Texas’ wide-open spaces help solve the country's nuclear waste storage problem? House Speaker Joe Straus wants to find out. He has instructed lawmakers to study the economic potential of storing highly radioactive nuclear waste in Texas, a notion that has drawn pushback from environmentalists. But if past and present politics are any guide, the state, already home to some low-level radioactive waste, won’t house the higher-level waste any time soon — even if Texans agree they want it. 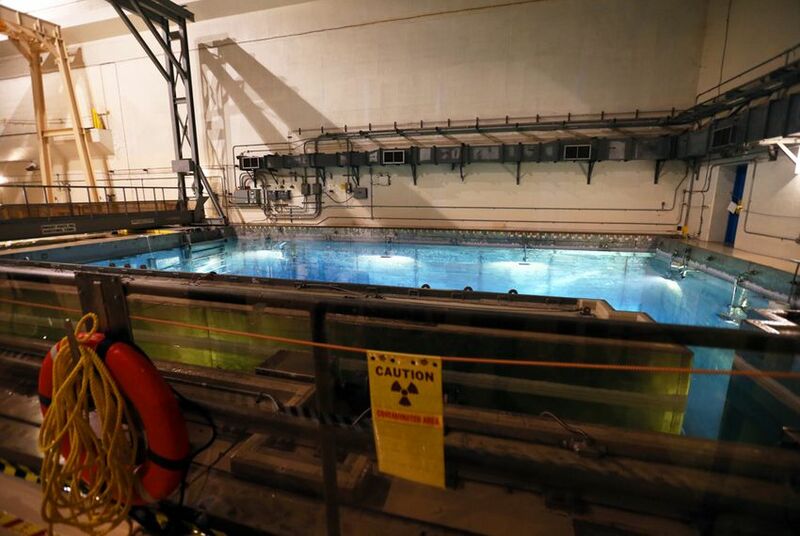 Amid Washington's long-thwarted search for a final resting place for the roughly 70,000 metric tons and counting of spent nuclear fuel and other highly radioactive waste, many observers echo Klein’s assessment. Meanwhile, waste continues to pile up at temporary storage facilities at operating and shuttered reactor sites throughout the country. Now, Texas lawmakers are set to consider whether the state could be part of the solution and, if so, how Texas might benefit. Erin Daly, a spokeswoman for Straus, said the speaker’s idea came after he reviewed a 2012 report from the Blue Ribbon Commission on America's Nuclear Future, assembled by President Obama, which recommended that U.S. lawmakers focus on gathering state and local consent before proposing a new facility. Straus has offered few specifics on the idea, such as where a Texas facility might be. That would be for the House committee to decide. "The speaker looks forward to the committee's review of the issue and their detailed report," Daly said. Texas, with its ample space and arid climate, could be an ideal home for the nation’s nuclear waste, some observers say. In 1984, Deaf Smith County, which nudges the New Mexico border in the Texas Panhandle, was among three finalists for a repository before lawmakers chose Yucca Mountain. The issue divided the community, which sits atop the Ogallala Aquifer; it pitted farmers and ranchers concerned about risks to groundwater against merchants hoping the site would add jobs and tax revenue, spurring the local economy. A 2003 University of Nevada, Las Vegas study estimated that a repository at Yucca Mountain would add $228 million to Nevada's economy each year during construction and $127 million annually during operation. The study also said the government would need to construct a robust outreach program to prevent potential economic losses, such as businesses uprooting due to the stigma surrounding nuclear waste. Partly because of the past objections, Deaf Smith is unlikely to resurface as a possible host, said Klein. State lawmakers are more likely to eye communities in West Texas. Officials in Howard and Loving counties have expressed interest. But the idea of housing the waste anywhere in Texas has stirred angst among environmental groups, who, just hours after Straus released his plans, had already rebuked it. Though the nuclear energy industry insists that temporary waste disposal — either in pools or sealed in dry casks of metal or concrete — is safe and environmentally sound, it has long agreed that sealing the waste in geologic formations deep underground boosts protection against terrorist attacks and natural disasters, such as the earthquake and tsunami that rocked Japan’s Fukushima Daiichi nuclear power station in 2011. For more than 20 years, Washington saw Nevada’s Yucca Mountain as the solution, and the federal government spent tens of millions of dollars preparing it to accept the waste. But Nevada’s congressional delegation — led by Senate Majority Leader Harry Reid, a Democrat — has thwarted the project. And, facing significant political pressure, the Obama administration has abandoned the Yucca plans. That has left untapped a $30 billion waste disposal fund collected from U.S. electricity ratepayers. Meanwhile, as nuclear power generators foot the bill for interim storage at their reactors, they are winning large breach-of-contract disputes against the federal government, which had promised to take the waste off their hands by 1998. The U.S. Department of Energy expects those payments to total $21 billion by 2020. That means taxpayers are essentially paying twice for disposal. Texas is already home to one of the nation’s few facilities that accept low-level nuclear waste. Since 2012, Waste Control Specialists in Andrews County, a company that was formally owned by the late Dallas billionaire Harold Simmons, has disposed of contaminated tools, building materials and protective clothing, among other items, from shuttered reactors and hospitals. Environmentalists have closely scrutinized the company as it has broadened the scale of the waste it accepts, and the Sierra Club has challenged the site’s permits in court, saying the group was never given a hearing to voice its objections to the project — namely that groundwater would enter its disposal wells. “It just seems like the goalposts constantly move,” said Cyrus Reed, conservation director for the group’s Texas chapter. Even if Texas asks for consideration, Congress would need to change the 1987 law naming Yucca Mountain as the nation’s repository for high-level radioactive waste. The U.S. House and Senate remain sharply divided on the issue. While the Senate, led by Reid, seeks to look beyond Yucca Mountain, the House wants to see the project through, citing the large investments already made. In the time it takes Congress to ultimately reach a consensus, turnover in state legislatures could mean that Texas or any other state that might ask host a site will change its mind. Still, advocates of permanent storage say they will monitor discussions in Texas, hoping the talk will educate more people about a political standoff that’s costing U.S. taxpayers billions of dollars. “Any interest outside the Beltway is positive,” said Everett Redmond, director of nonproliferation and fuel cycle policy at the Nuclear Energy Institute in Washington. With the difficulties in mind, some — Barton included — have suggested permitting one or two centralized facilities to temporarily store the waste while Washington continues to wrangle over the long-term site. Such a plan would not solve the long-term disposal issue, but it would remove responsibility from electric generators and halt the lawsuits against the federal government. Developing even a temporary site, however, could take as long as 10 years, Redmond said. Texas lawmakers will also study the feasibility of bringing to the state an interim facility, which would store waste from around the country, according to Straus’ instructions. “I would welcome one of those facilities in Texas, as long as the community welcomes it,” Barton said.